Mike Krueger and Dr. Amanda Stuart are avid adventure seekers, teaming up to share their expertise on how to keep your dog safe this summer. It’s safe to assume that if you live in North Lake Tahoe you love nature, dogs, and enjoying nature with your dogs. Warm temperatures are begging to get you out of the house and into the sunshine, but before taking off with your four-legged friends there are some important things to keep in mind to ensure a happy, healthy pup. Dr. Amanda Stuart and Mike Krueger have launched a Wilderness First Aid course unlike those to which you’re accustomed — their courses are designed for your dog. Dr. Stuart is a veterinarian, as well as an avid Tahoe backcountry skier, hiker and rock climber who loves dogs and wants to share her expertise with locals and visitors to ensure pets are well taken care of out on the trail. Krueger is a guide with T3 Adventures, who spends as much time in nature as possible leading outdoor trainings as an emergency care instructor specialized in wilderness first response and mountain rescue. 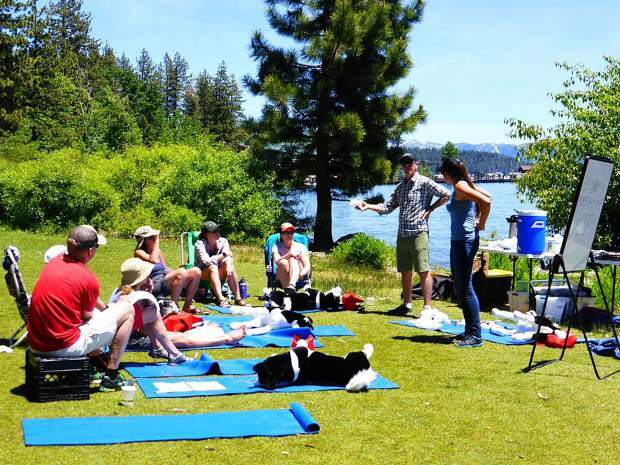 Together, they’ve created the four-hour, Wilderness First Aid for your Dog seminar hosted at the Cedar House Sport Hotel, complete with a field guide booklet. This week they’ve collaborated to offer locals their top five tips for dog-friendly adventures. Prior to hitting the trail be sure you are familiar with the scenery and anything you and your dog may encounter. “You should know the environment, temperature any other animals in the area like porcupines or rattlesnakes in our region — think ahead of everything you might encounter,” Dr. Stuart said. The pair urges adventurers to keep an eye on their dog’s behavior and energy level as well. Know your dog’s normal mannerisms and pay attention to any unusual behaviors while out on the trail that could signify discomfort or a potential problem. Just like people, dogs need to stay hydrated and well fed when exerting themselves physically. Dr. Stuart and Krueger recommend 1 ounce of water per pound each day for your pet’s normal water intake. Increase those numbers when exercising or when visiting from lower altitudes. “There is regular panting and what I call splay-panting, where the dog’s tongue is flapping out of their mouth and they’re really breathing hard. If that happens it’s time to sit in the shade and drink water,” Dr. Stuart said. Krueger added that the aforementioned attention to your dog’s behavior will help you respond before they become too dehydrated. “Is your dog fit enough for the trip?” Dr. Stuart asked. Overweight dogs, just like overweight people, need to build up to bigger trips that demand more physicality. In addition to your dog improving their fitness, they also need time to build callouses on their pads. Krueger and Dr. Stuart explained that North Lake Tahoe’s granite rocks could tear dog pads and hot surfaces can cause blisters. Krueger added that if trained while puppies, dogs can acclimate to booties, which will protect their paws for all kinds of water and land adventures. If you’re just starting to adventure with your dog, the experts suggest starting with a moderate trail that lasts a few miles and has less challenging hills, adding distance and varied terrain over time. Unlike humans, dogs aren’t able to sweat to release heat, “they can sweat through their paws but that doesn’t help much,” Dr. Stuart said. Panting is your dog’s only form of thermoregulation, so pay attention to whether it seems like they’re working too hard, take frequent breaks and give them plenty of water to keep from overheating. Whenever you’re thinking of leaving your dog in a hot car temporarily, the experts also urge you to come up with another plan. Just as you prepare yourself for an adventure, think of the things that your dog might need to also be comfortable and prepared for anything that could happen. “You bring a first aid kit for yourself, right? What about a first aid kit for your dog?” Dr. Stuart said. Keeping items that could come in handy on the trail is always a good idea. To get a complete lesson on what to bring and how to respond to a situation out in the wilderness be sure to attend the Wilderness First Aid for your Dog course with Krueger and Dr. Stuart.